As you walk into the locker room, you could sense her cheery smile. When you had a rough day or talked yourself down, sophomore Emma Edes was always there to hand you a plate of positivity and inspiration. She was known as the team’s cheerleader because she always shared her brightness with others. On the court, she’d always be working on improving her game during practice or outside of school. This summer, she was finally able to become a part of her dream team. Edes began her journey at just the age of seven. She began to grow and learn as she aged and explored her tennis career. She formed and realized her dreams and goals, and one of them was to become a member of Dragon Tennis once she became a teenager. “My favorite part about tennis is just the acceleration you get when playing,” Edes said. When she plays, she is able to relieve her stress from school and just focus on something she is passionate about. 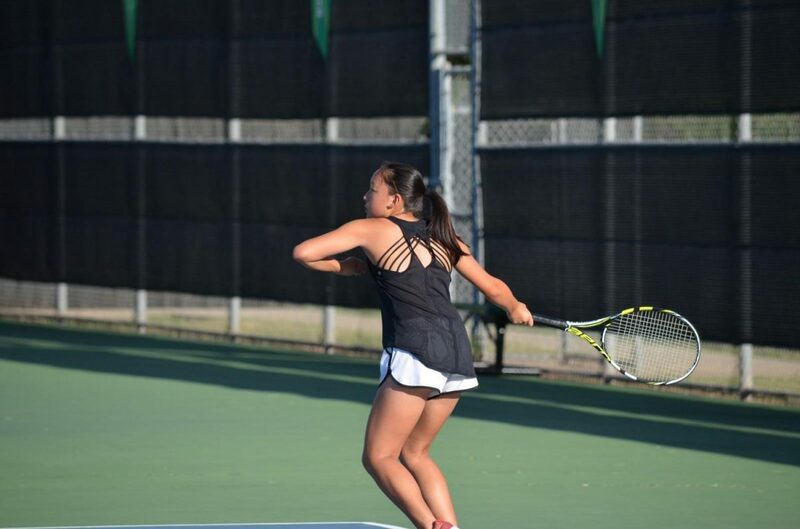 On and off the court, she is strong and motivated to get better with tennis and her academics. Whenever I get to see Emma, she will always say hi while in the hallway and, if she has time, she loves to get into a conversation. “My favorite quality about Emma is her positivity as she always cheers me up and motivates me,” junior Emily Cheatham, a close friend, said. As of her freshman year, she had gladly made the JV team, yet you could tell she wanted to make Varsity. Last season, she moved up the ladder and by the end of the year she fulfilled the number two spot on JV. Coach Aldridge, the head varsity and JV coach gave her a spot for Varsity tryouts. “My favorite trait of Emma is her honesty because if you ask for her opinion on anything she will give you the facts,” senior Kelsey Sun, a close friend, said. All of her hard work payed off in August as she completed the tryout process and she became one of the newest members of the varsity team. “I think the major difference between JV and Varsity is, besides, obviously the level of play, is just the time commitment. Varsity has two matches a week in the fall vs. only one for JV and Varsity practices almost every morning at 7 a.m.,” Edes said. As her dream finally came true, excitement is building for the future of her tennis career. “I have to give credit to Coach Aldridge because he always has positive lessons and reminders for us. No matter how cheesy or tedious they may seem, they are lessons that I believe we all [should] value and practice during our match and even just daily life,” Edes said.